If the vehicle speed exceeds the speed limit sign displayed on the active driving display, the warning sound is activated and the area around the speed limit sign displayed on the active driving display flashes 3 times in amber, and if the vehicle speed continues to exceed the displayed speed limit sign, the indication stops flashing and remains on. Check the surrounding conditions and adjust the vehicle speed to the legal speed using the appropriate operation such as depressing the brake pedal. 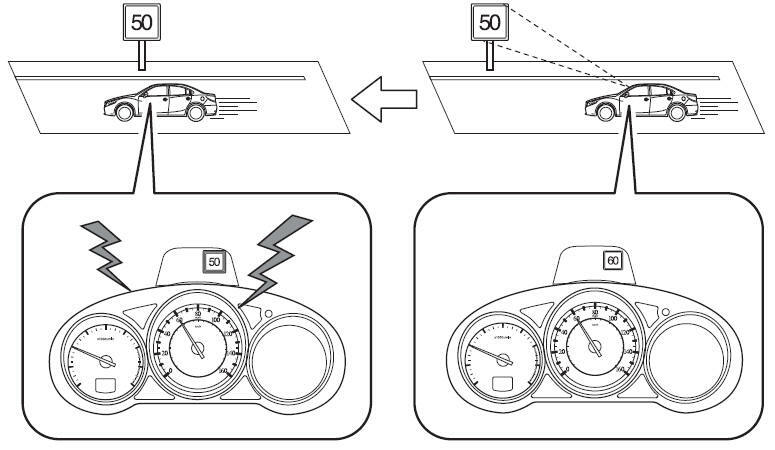 The excessive speed warning is initially set to inoperable. If you want to activate the excessive speed warning, change the setting in the personalization features. Off: The excessive speed warning is not activated. Warning display only: The area around the speed limit sign flashes 3 times in amber, and if the vehicle speed continues to exceed the displayed speed limit sign, the indication stops flashing and remains on. sound: The area around the speed limit sign flashes 3 times in amber, and if the vehicle speed continues to exceed the displayed speed limit sign, the indication stops flashing and remains on and the warning sound is activated. In the following cases, the excessive speed warning stops operating. The vehicle speed is less than the speed of the displayed speed limit sign. (If the activation timing for the excessive speed warning is changed in the personalization features, the excessive speed warning stops operating when the vehicle speed is less than the changed vehicle speed. A speed limit sign indication has been updated and the conditions for activating the excessive speed warning are not met. Display of the speed limit sign stops. The warning indication is displayed at the same time the excessive speed warning sound is activated if the vehicle speed exceeds the speed indicated on the speed limit sign. Refer to Warning Sound is Activated. If the Forward Sensing Camera (FSC) displays a speed limit sign which was recognized incorrectly, the excessive speed alarm is activated even if the vehicle is driven at the legal speed. The following settings can be changed for the excessive speed warning.